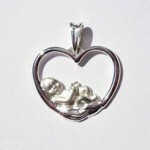 Jewelry for Mom & Baby for pregnancy, birth, adoption, pro-life, baby showers, premature birth, child loss, Mothers Day…and all gift-giving occasions for mother and child. Jewelry for Mom ~ Since 1999! A mother holds her baby in her heart; it’s the embodiment of motherhood. 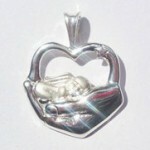 A pure mothers charm in fine sterling silver. 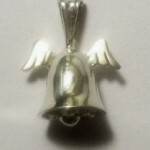 A baby angel is held safely in its mother’s heart in this fine sterling silver charm. 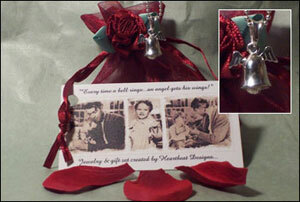 Actress Karolyn Grimes aka “Zuzu Bailey” of Frank Capra’s classic “It’s A Wonderful Life” commissioned Heartbeat Designs to create a special keepsake in this fine sterling silver charm! “The conception of her design honoring motherhood was skillfully crafted to capture the Designer’s exact interpretation; a pure interpretation that needs no words to convey its meaning. One that is universal in that it’s a baby in a heart; all mothers hold their baby in their heart. Nothing embodies “motherhood” more than a baby in its mother’s heart ~ it is the embodiment of motherhood. Notice: Heartbeat Designs are Trademarked ® Any infringement will be pursued to the fullest extent of the law.